You will be scrolling through your news feed and something truly amazing will come up that sounds almost too good to be true and in the end when you click on the link to watch the video or read the article you end up getting nothing but disappointment. This is a growing trend and while it may seem like a straight forward and obvious reason, it actually stems deeper than you would suspect. Websites are making titles that sound far more enticing to click on to drive traffic and increased advertisement revenue. The reason for this is there is almost too much content on the internet. When you do a simple Google search you are given millions of results on almost any term imaginable. This means websites are needing to rely on a new signal to drive their post to the top of the page and to drive traffic that signal is through social media websites. Social media websites are a huge social signal to a high performing article if there are many shares or clicks driven to it then a search engine will notice it and drive it closer to the top of the page because many people enjoy that result. Then when someone goes to look for the article they generally don’t look past the first two pages of Google so the one that has the traffic is going to be towards the top of the page. As you can see from the infographic above social signals play a big role in the ranking of a websites article. So, how do you get someone to like and or share an article give it an amazing title. In an article published by slate it states how most people don’t finish the article before the share it. 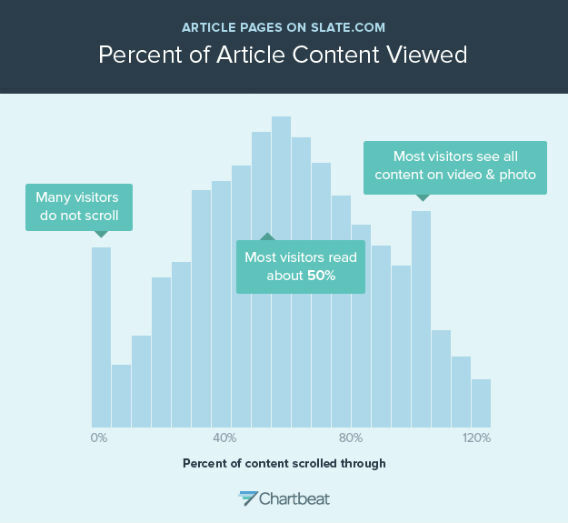 As we can see Chartbeat did a performance check of the visitors of slate.com and most visitors are not even finishing the article. The title is what draws their attention in fact many people on social media websites share without even viewing the article it is based solely off the article title. Now there is hope for new websites, and for content creators. Google is looking to make changes to change the impact of social media shares on their search engines. The reason for this is exactly for the type of people exploiting the system as it is. This means that poorly written, unsourced articles will be scoring lower. But in conclusion it all comes back to one thing money. Here is an example and a really good explanation by internet comedian Ryan Higa.